The festivities began with the opening of the pre-race fitness expo and on-site registration Friday followed by a community concert beach party and bonfire beginning at dusk and fireworks. It was lights out early for the racers as the competition began at 7:30 AM with the running of the 5K followed by the 10K, one mile and Kids Dashes. The awards/post race party was held immediately following with participants and guests enjoying the food, refreshments and live music in a tropical paradise behind the Sirata Beach Resort. 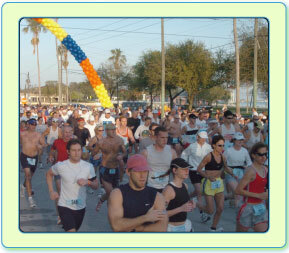 A new venue for the fifth running, the Sirata has agreed to host the event again in January 2012!